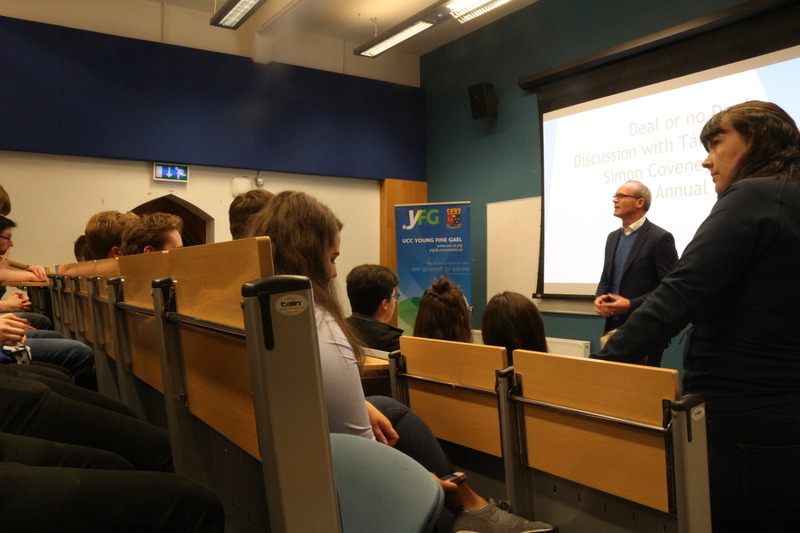 On the night of Monday 1st October, UCC’s Young Fine Gael Society hosted an event with An Tánaiste Simon Coveney in the West Wing 5, which was open to the public. The discussion was due to centre around the ongoing Brexit negotiations and other topical issues. As Mr Coveney entered the room, he was immediately halted and encountered by Alex Homits, who is a member of the Connolly Youth Movement. The CYM is an Irish youth organisation founded in 1963 which is linked to the Communist Party of Ireland and has members all over the country. The organisation were last year involved in occupying and repurposing three derelict houses in the UCC area as part of an initiative to raise the issue of rising levels of homelessness. Mr Homits, who is currently studying law in UCC, along with another colleague from the CYM accosted Mr Coveney from the get-go in relation to his party’s failure to deal with the housing crisis and homelessness, while also referring to his brief tenure as Minister for Housing. Many of those in attendance, upon questioning, were quoted as saying they were upset by the outburst, not necessarily due to the opinions that Mr Homits conveyed but the way in which he expressed them. A number of expletives were used in the process and after he described the Tánaiste as a “smug scum f*** b******” Mr Homits was asked to leave the room by a representative from UCC Societies. The University Express reached out to Mr. Homits for comments on the event. According to Mr. Homits, what occurred had been planned by the CYM earlier in the week. “When members of the CYM heard of the event we immediately thought it was a perfect opportunity to raise very real and concrete questions about his [Coveney] time as housing minister and prepare these statements that we made.” Alex continued by saying that he does not care if people were offended by what he said. “I apologise for nothing. I think that if people are more upset by what I said rather than the stats that I mentioned then that’s abysmal in itself. The chairperson of UCC’s Young Fine Gael Society, Danielle Gayson, noted regarding the events “We don’t want to limit anyone’s freedom of speech in these types of discussions so we would just try to chair it in a way where there would be respect throughout the debate. We don’t want our guests to feel put out and we feel that they should be able to respond with their own evidence and statistics”.